Dear saints of God: grace, mercy, and peace to you from God the Father and our Lord and Saviour Jesus Christ. Amen. Death is real. Most of us have come face to face with the reality of death as we have lost friends and family. Some of us have seen death recently and still struggle to come to grips with its reality. But death is real. In the face of death, the world has no answers. You know this from reading sympathy cards, watching movies and television shows, and listening to eulogies. “Your loved ones are in your heart.” How nice and tidy. The world tries to sterilize and sanitize death: There is no afterlife. The body in the grave is just a bunch of cells not your dearly departed. In fact, let’s sterilize that as well and just cremate the remains so there is no body that gives witness to the reality of death. Trying to hide the reality of death and sanitize it is an attempt to hide the reality of sin which is the cause of death. If death is sterilized, then maybe sin which is punished by death is sterilized as well. We can certainly speak of our loved ones being in our hearts in that we remember them. But if they only live in our memories, what does that mean for those who died a long time ago? What does it mean for our great, great grandparents? What does it mean for those who are starting to forget the face of their dear child who passed away or what their dear spouse’s voice sounded like? Living in our memories and hearts is no consolation to the reality of death. But still, it is a temptation to think this way. That’s why eulogies have even crept into some Christian churches. If we can just speak well of the deceased and talk about all the good things that he did during his lifetime then he will be remembered not just by his family but by everyone at the funeral. Then he will really live in our hearts. If we can convince those attending the funeral that he was a good man, maybe we can also convince God that he was a good man. But if our loved ones are only in our hearts as we remember them and we only remember them for the good that they did then they are all in serious trouble. Then we all are in serious trouble. Perhaps Saint Peter and Saint Paul are okay – we remember them still two thousand years later – but what about me? What have I done that will be remembered for years to come? What significant good and memorable things did our loved ones accomplish before they died? We better be pretty creative and allow some artistic license in the eulogy! Of course, none of this is what Scripture teaches. Scripture teaches that our loved ones are not only in our hearts. Their bodies are also in the ground waiting for the day of resurrection. Our loved ones who have died in the faith will be raised to eternal life just as Jesus was raised from the dead after His death on the cross. While they wait for the day of resurrection, their souls are already in heaven with Jesus now. Jesus told the thief on the cross who repented and believed, “Truly, I say to you, today you will be with me in Paradise”! Today, not someday! Everyone who believed in Jesus and has died is with Him even now. And they didn’t get to heaven by being remembered by us or by doing some good things that are memorable. Our text from Revelation doesn’t say that the people in heaven made their robes white by doing something good or memorable. Our text doesn’t say that they washed their robes in their good works and the sweat of their brow. Our text says, “They have washed their robes and made them white in the blood of the Lamb.” They have been washed clean by the blood of the Lamb of God who takes away the sin of the world (Jn. 1:29). Jesus’ blood, given and shed for them for the forgiveness of sins has washed all their sins away and brought them into heaven with Him. This is the great consolation in death. Not that our loved ones are remembered by us, but that they are with Jesus now in Paradise because they were cleansed by His blood. The blood of the murdered Abel cried out for vengeance, but the blood of Jesus cries for our pardon. The cup of the new covenant in Jesus’ blood gives us pardon for our sins, and also joins us in communion with the innumerable angels in festal gathering, and to the assembly of the firstborn who are enrolled in heaven, and to the spirits of the righteous made perfect. The assembly of saints gathered here is in communion with the assembly of saints gathered with Jesus in Paradise. That’s why in the communion liturgy we hear, “Therefore with angels and archangels and with all the company of heaven we laud and magnify Your glorious name, evermore praising You and saying” and then we sing “Holy, holy, holy” which is the song that Isaiah tells us is sung in heaven (Is. 6:3). We sing here what is sung in heaven. In receiving Jesus’ true body and blood, we are in communion with our loved ones who have died in the faith. In Holy Communion we have a foretaste of the feast to come. Our hearts are lifted up to the Lord as we gather around the communion altar. Communion is not limited by time or space. We join the saints who have gone before us in their ongoing heavenly worship of the Lamb who was slain. We have been cleansed by the blood of the Lamb just as they have been cleansed by the blood of the Lamb. The difference is that we hunger; they hunger no more. We thirst; they thirst no more. The sun and the scorching heat strike us but not them. We cry, we mourn, but God has wiped away every tear from their eyes. We do remember our loved ones who have died. We remember that they have been cleansed by Jesus’ blood as we also have been. We remember Jesus’ promises to them that have now been fulfilled as they are with Him in heaven. And we remember that those same promises are for us. Jesus’ death on the cross was also for us. The payment of His blood for all sins was for our sins. Unlike the world, we don’t have to be afraid of death. We don’t have to try and sterilize and sanitize death. We don’t have to be afraid of seeing a dead body. We know that Jesus has promised the resurrection of the body. We don’t have to be afraid if our loved ones are just ashes, because in the resurrection He who created man from dust will raise them up whether they are dust or ashes. We also know that the existence of our loved ones is not up to us remembering them in our hearts. They exist with Jesus. Their souls are with Jesus even as their bodies await the day of resurrection. This is the comfort to you who mourn. Finally, we have communion with our loved ones who have died in the faith. Since they are united with Christ and Communion unites us with Christ, we are thus also united with them as we receive the body and blood of Christ for the forgiveness of sins. In Communion we receive the same cleansing blood of the Lamb that has cleansed all saints. Saint Peter and Saint Paul were also cleansed from their sin by the blood of the Lamb because even their good works counted for nothing. In Communion we are united in the same forgiving blood of Christ. Yes, death is real, but so is eternal life. And we have the promise of eternal life when we die from this life. As the saints before us, we will then worship the Lamb in heaven away from this world of tribulation and tears. Upon our death, we will also realize the perfection of heaven away from tribulation and tears. We will be united with all saints – those who went before us and those who are still to come – all who have washed their robes and made them white in the blood of the Lamb. Amen. Dear people clinging to the promises of God: grace, mercy, and peace to you from God the Father and our Lord and Saviour Jesus Christ. Amen. “Jesus, Son of David, have mercy on me!” This is not a cry of despair. Rather, it is a prayer of faith. It is a prayer confessing who Jesus is, and a request for mercy to the only one who is all-merciful; a request to the one who is all-powerful and thus able to show mercy. Blind Bartimaeus, as he sat begging on the roadside, could have cried out many things when he heard that Jesus was passing by him: Jesus, why me? Why am I blind and begging in the dirt? What did I do to deserve this? Am I being punished for something? Don’t you care? These are the prayers we are tempted to pray, and perhaps even sometimes do pray: prayers that question God and His will for us; prayers that doubt God’s ability to help; prayers that doubt God’s love for us. Such prayers lift ourselves up as if we don’t deserve anything bad to happen to us. Such prayers raise our eyes too high, seeking to understand God’s hidden counsel and will. Such prayers occupy ourselves with things too great and marvellous for us to understand. But the prayer, “Jesus, Son of David, have mercy on me!” is none of these things. First of all, it acknowledges who Jesus is. He is the Son of David; the offspring promised to King David whose throne is established forever (2 Sam. 7:13); the Son of David who will cause God’s people to dwell in everlasting peace, bringing in rest from all our enemies in His eternal kingdom (2 Sam. 7:10-11). It confesses that Jesus is the promised Saviour of the world. Praying thus to Jesus for mercy also confesses that mercy is needed. Praying for mercy is praying for compassion and pity. It is praying to God to act according to His nature – that of loving-kindness and faithful graciousness – since He is slow to anger and abounding in steadfast love (Ex. 34:6). Bartimaeus confesses in his prayer that there is nothing in him deserving anything from Jesus, but that out of His steadfast love and mercy He would give it anyway. Only someone who recognizes his sinfulness can pray in this way – one who realizes that in and of himself he has no right to ask God for anything, yet at the same time clings to the fact that God is merciful and does not want to give us what we deserve since we deserve only punishment. Only someone can pray this way who has learned from the Law of God that because of our sin we deserve temporal and eternal punishment, and yet knows that God is merciful, pardoning iniquity and passing over transgression, not retaining His anger forever because He delights in steadfast love; knowing that God will have compassion on us and tread our iniquities underfoot; that He will cast all our sins into the depths of the sea (Micah 7:18-19). Bartimaeus’ prayer did not question God or His will. His prayer did not doubt God’s ability to help or doubt God’s love. His prayer did not lift himself up as if he didn’t deserve his blindness or poverty, nor did Bartimaeus raise his eyes too high, seeking to understand God’s hidden counsel and will by seeking to know why he was suffering. Bartimaeus’ prayer does not seek answers to those things which are too great or marvellous to understand. It is a humble prayer that Jesus would not leave him helpless. It appeals to Jesus’ nature as God – abounding in steadfast love. It confesses that Bartimaeus cannot help himself, but needs the Son of David to intervene. Bartimaeus’ prayer of faith could not be squashed even by the crowds that told him to shut up. The rebukes and chiding of the crowd only got Bartimaeus to cry all the more, “Son of David, have mercy on me!” Bartimaeus’ faith clung to the promises of God as we heard from Jeremiah, that the Lord will save His people, gathering even the blind and the lame from the farthest parts of the earth as they come with weeping and pleas of mercy (Jer. 31:7-9). And indeed, Jesus did show mercy to Bartimaeus. He said, “Go your way; your faith has made you well.” What Jesus really said is, “Go your way; your faith has saved you.” Yes, Bartimaeus could now see with his physical eyes, but even more, Jesus had given him faith that opened his spiritual eyes even while he was still physically blind. Bartimaeus had faith in Jesus to save even while he was physically unable to see. It was this faith that enabled him to pray a prayer of faith, asking for mercy. You too can pray the prayer of faith that Bartimaeus prayed. “Jesus, Son of David, have mercy on me!” In your suffering, loss, or hardship do not ask “Why?” and seek answers that God has not given you, raising your eyes too high and occupying yourself with things too great and marvellous for you. Do not question God’s will for you or doubt His ability to help. Do not doubt God’s love for you. Rather cling to His promises and pray for mercy. God is by nature loving and merciful. He desires to show compassion and pity on you. He is slow to anger and abounding in steadfast love. God loves you to the point that He sent His only begotten Son into the world to bear your sins and take the punishment of your sins. Jesus, God in the flesh, took your sins to the cross and died for them there. Your sins were buried in the tomb and remain there even though Jesus arose. Your sins can no longer accuse you. So you can pray to Jesus for mercy because you know that He is merciful. You know that He has shown you mercy and will continue to show you mercy. He will not give you what you deserve for your sin because He took what you deserve for your sin. The Son of David has brought you into His eternal kingdom in which He gives you everlasting peace and rest from all your enemies – especially sin, death, and the devil. He gives you faith and then tells you, “Go your way; your faith has saved you.” So cling to His promised mercy and pray, “Jesus, Son of David, have mercy on me!” Amen. Dear recipients of salvation: grace, mercy, and peace to you from God the Father and our Lord and Saviour Jesus Christ. Amen. “Impossible,” says Jesus. For man it is impossible to be saved. There is nothing we can do to be saved. We cannot earn our salvation. We cannot buy our salvation. We cannot even find our salvation. If it is up to man, we are hopeless and helpless. For us it is impossible to be saved. Yes, it is easier for a camel to go through the eye of a needle than for a rich person to enter the kingdom of God, but it is just as impossible for a poor person to enter the kingdom of God. For man it is impossible to be saved. It has nothing to do with wealth. It has nothing to do with health, age, race, gender, or intelligence either. When it comes to salvation, it is impossible for man. Because we are sinful we continue to do what we should not do, and we continue to not do what we should do. We continually break God’s Law by thought, word, and deed. We deserve temporal and eternal punishment for our sins, not eternal life. For man it is impossible to be saved. But not for God. All things are possible for God. Salvation is not only possible with God, but it is already accomplished with God. When Jesus said, “It is finished” and gave up His spirit on the cross, salvation was won for us; salvation was accomplished. Jesus earned our salvation. He purchased our salvation with His holy precious blood and with His innocent suffering and death. Jesus saved us, because all things are possible for God. And God gives us salvation in ways that make it clear that salvation is impossible for us but not for Him. First Peter 3(:21) says, “Baptism… now saves you.” Talk about impossible for man but possible for God! Water poured over the head of a new-born infant – in such a helpless stage of life – hopeless to fend for themselves against anyone or anything, especially sin, death, and the devil. It so obviously shows how impossible salvation is for man that many reject what Scripture says about Baptism. Baptism cannot save you they say. How can a baby be saved? With man, it is impossible that Baptism saves, but not with God. For all things are possible with God. And God has chosen exactly this humble sprinkling of water to save and wash away sin to demonstrate to us how helpless and hopeless we are on our own against sin, death, and the devil, and how powerful He is to save us. 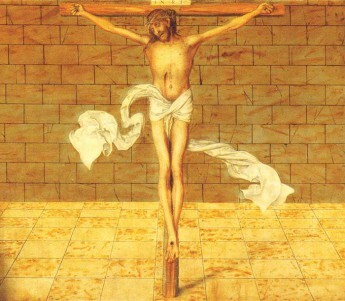 Jesus says, “This is my body… This is my blood… for the forgiveness of sins.” (Matt. 26:26-28) Once again, with man it is impossible that bread and wine save. A wafer of bread and a sip of wine given even at a nursing home deathbed to someone in a helpless stage of life – hopeless to fend for themselves against anyone or anything, especially sin, death, and the devil. This too so obviously shows how impossible salvation is for man that many reject what Scripture says about the Lord’s Supper. The Lord’s Supper cannot save they say. With man it is impossible that the Lord’s Supper saves, but not with God. For all things are possible with God. And God has chosen exactly this humble bread and wine to give the forgiveness of sins along with life and salvation to demonstrate to us how helpless and hopeless we are on our own against sin, death, and the devil, and how powerful He is to save us. This then is our reality. Salvation is impossible for us. No matter how hard we strive to do good, to avoid bad, and to get ourselves right with God, we will only fail. Young or old, rich or poor, it makes no difference. Salvation is impossible for us. The harder we try, the more we turn away from God. The better we think we are, the less we go to where God actually gives us salvation. God gives us the forgiveness of sins in such humble ways, but our pride prevents us from receiving it. We don’t think we need it. We must think salvation is possible for us. We must think we can save ourselves. We must think that we can face sin, death, and the devil on our own. That’s why it is so difficult to enter the kingdom of God. It’s so difficult to enter the kingdom of God because we don’t want to enter through Baptism. We know a better way. It’s so difficult because we don’t want to stay in the kingdom of God through the Lord’s Supper. We know a better way. It’s so difficult because we think we know better than God. We think salvation is possible for us. Stop trying to do the impossible! “Today, if you hear his voice, do not harden your hearts” writes the author to the Hebrews quoting David (4:7). Rest from your labours as God has rested from His labours. Don’t work to do the impossible; God has already done what is impossible for you. Jesus has already accomplished your salvation. His suffering and death was for you for the forgiveness of all your sins, and He gives you all the benefits of His completed work through His Word and Sacraments. It is done. It is finished. Given and shed for you for the forgiveness of sins. So there remains a Sabbath rest for you, “for whoever has entered God’s rest has also rested from his works as God did from his.” (Heb. 4:10) Rest in Christ. Daily return to your Baptism and trust the work that Christ as accomplished for you. Receive the Lord’s Supper often to nourish you and keep you in the kingdom of God. Rest from your work as God rested from His work on the seventh day. Any work that you do to try and save yourself or try and make yourself pleasing to God is an act of disobedience and rebellion. Jesus has already saved you and made you pleasing to God the Father. Trying to get to the Father in any way other than Jesus is an act of unbelief. So rest from your work. Rest from your work and receive the salvation Jesus accomplished for you on the cross. Rest from your work in your baptismal grace. Rest from your work and receive the benefits of Jesus’ work through receiving His body and blood. Salvation is impossible for man, but not for God. God has accomplished what is possible only for Him. He has saved us, and gives us His salvation freely, even in humble form. Amen. Dear people who are greatly blessed: grace, mercy, and peace to you from God the Father and our Lord and Saviour Jesus Christ. Amen. Do you want Jesus to look at you lovingly? Sounds like a simple enough question with a simple enough answer: of course I want Jesus to look at me lovingly. The rich young man who ran up to Jesus would probably have answered the same way before he knew what it meant. The rich young man showed great enthusiasm as he ran up to Jesus and knelt before Him on the ground. “Good Teacher,” he said, “what must I do to inherit eternal life?” Surely this Jesus, as a great teacher, would know what he had to do. Jesus answered his question. If he wants to do something to be saved, he has to do it through the Law. He has to keep the Law. Jesus says, “You know the commandments” and He lists off several of them: “Do not murder, Do not commit adultery, Do not steal, Do not bear false witness, Do not defraud, Honour your father and mother.” If you want to do something to be saved, here’s what you have to do; you have to keep the Law. But the Law bounces off of the rich young man. It has no effect on him. He replies to Jesus’ preaching of the Law, “Teacher, all these I have kept from my youth.” He thinks he’s done everything necessary to save himself. He sees no sin in himself. He thinks he has met all of the demands of God’s Law. So Jesus looked at him, loved him, and said to him, “You lack one thing: go, sell all that you have and give to the poor, and you will have treasure I heaven; and come follow me.” That’s what Jesus tells you when He looks at you with love? Sell everything you have and give to the poor. So again, I ask, do you want Jesus to look at you lovingly? Now before you answer “no” to that question, let’s examine why Jesus would answer this rich man in such a way. How could it be loving to tell the man to sell everything he has and give to the poor? The rich man thinks that he has kept God’s Law. The Law has not done its work in his heart. If you can hear the preaching of the Law as this rich man and confidently say that you have done it all, then the Law is not done with you yet. You have to get to the point that the Law is too much to bear; that the Law demands too much from you. Jesus had to hit him one more time with the Law to wake him up to the realization that he has not and cannot keep God’s Law. Sell everything you have and give to the poor, and come follow me. Isn’t this what the First Commandment demands of us? God must be first in our hearts. Nothing else can be more important. No possession, no person, nothing. Jesus looked lovingly at the rich young man, and crushed him with the Law. The man then recognized his attachment to his riches. Thus, he was disheartened by Jesus’ saying and he went away sorrowful, for he had great possessions. He didn’t want to give up what he had. He was more attached to his earthly possessions than he was to God. Jesus lovingly showed this to him so that he would realize that he has not and cannot keep God’s Law. Immediately following this, Jesus says, “How difficult it will be for those who have wealth to enter the kingdom of God!” And “It is easier for a camel to go through the eye of a needle than for a rich person to enter the kingdom of God.” (vv. 23, 25) This shocked the disciples. They undoubtedly thought, as many do today, that being rich is an indication that God is pleased with you because He is so richly blessing you with wealth and possessions. Surely if God has blessed you in this life He will bless you in the life to come, right? But Jesus says it’s easier for a camel to go through the eye of a needle than for a rich person to enter the kingdom of God. The more we have, the more easily we become attached to it. Wealth can also quickly become fuel poured on the fire of our appetites and lusts as it enables us to pursue our appetites and lusts. Wealth also brings a certain power, along with the thinking that we are able to control our own lives and even manipulate the lives of others since we have the means to do so. Certainly very often wealth leads us to focus more on ourselves and tempts us into selfish and unfruitful choices, leading us away from loving our neighbour as ourselves. And certainly we as a nation have been blessed with more wealth than many generations before us and many nations around the world. So at this time of Thanksgiving, what are you thankful for? We are very often ready to give thanks to God for the wealth that He has given to us. But how often are we ready to thank God for what we do not have; to thank Him that we don’t have all the wealth our hearts would desire, knowing the temptations it would bring? Even further, when we pray, do we pray that God would take away from us that which is not good for us? Do we pray, “Christ Jesus, Lord of our lives, destroy all that we have built with our hands, and bring to ruin all of our plans, and frustrate all our hopes that would seek more than is good for us”? Do we pray, “Lord God, open my selfish and greedy heart to release my sinful grasp on the possessions you have entrusted into my stewardship so that I would generously give to those in need”? Do we pray, “Lord, cause my pension fund to crash, my house to burn down, and my car to be stolen because I am too attached to my possessions”? I don’t think those are prayers that we pray. But we should pray in exactly this way. We should pray that God take away from us that which would lead us away from Him. We don’t know what the end result was for the rich young man who came to Jesus, but Jesus didn’t just look at him lovingly to hammer him with the Law. Jesus looked at him lovingly to lead him to see his sinfulness and his need for a Saviour. Jesus does the same to you. Whether you want it or not, Jesus does look at you lovingly. He lovingly uses the Law to crush your thinking that you have kept the law perfectly. He lovingly brings you to despair so that you might despair in yourself, not in Him. Jesus leads you to despair in yourself so that you will cling to His promises. He leads you to despair in doing something to get eternal life so that He will give you eternal life as a free gift. As often as the Law accuses you of your sins, you must admit that the Law is right. You are guilty. The Law is too much to bear; it demands too much. You are a sinner and have not, do not, and will never keep God’s Law perfectly. But Jesus did keep the Law perfectly in your place. Although the Law demands too much of us, Jesus met the Law’s demands. His entire life was for us and our salvation. He died for us and in our stead. We should have been the ones crucified for our sins. We should have suffered hell for our sins. Instead, Jesus was crucified for us. He suffered hell for our sins. By His agony and bloody sweat; by His cross and passion; by His precious death and burial; by His glorious resurrection and ascension Jesus saved us. All our sins are forgiven. Jesus paid off the debt of sins of the entire world. He satisfied God’s wrath against the sins of the whole world. Because Jesus paid the debt of the sins of the whole world, you can know with certainty that He paid the debt of your sin. Your sin is covered. Your sin is removed from you as far as the east is from the west. Your sin is forgiven. So do you want Jesus to look at you lovingly? Yes, absolutely. If He looks at you lovingly as He crushes you with the Law, know that it is only so that He can comfort you with the Gospel, the sweet and comforting forgiveness of sins. There is nothing for you to do to inherit eternal life; Jesus has already done it for you. Amen. Wow! Another Bible passage on marriage! Marriage comes up so much in the Bible you almost have to think that God thinks it’s kind of important. I don’t think there’s a single book of the Bible that doesn’t teach pertaining to marriage. The Bible starts and ends with a marriage. The prophets frequently preached about marriage. Jesus regularly taught concerning marriage and the Epistles continuously bring it up. This makes sense, because marriage is the most honourable institution on earth. It is honourable because God Himself established it. Marriage was not invented by society to fit a certain need at a certain time. God instituted and established marriage in paradise as a gift for husband and wife. Marriage is God’s institution regardless of what governments think about it; regardless of what judges think about it; and regardless of what we think about it. The prophet Malachi writes that God still blesses marriage, even after the Fall. He writes that God is a witness to marriage and that God Himself joins husband and wife together. He makes them one with a portion of His Spirit in their union (Mal. 2:14-15). Marriage is the most honourable institution on earth. No wonder the devil attacks it so aggressively. Throughout history, marriage has been under attack by those who have said that life-long chastity is the ideal for Christians. Marriage has been under attack by those who have said fornication is the ideal; by those who have said that marriage is not for one man and one woman; by those who have said that marriage ends when I want it to end. But a Christian must see marriage as God sees it. God created male and female and blessed them saying, “Be fruitful and multiply.” (Gen. 1:28) And He said, “It is not good that the man should be alone. I will make a helper fit for him… Therefore a man shall leave his father and his mother and hold fast to his wife, and they shall become one flesh.” (Gen. 2:18, 24) “What therefore God has joined together, let not man separate.” (Mt. 19:6) This is God’s Word concerning God’s institution. But “Moses allowed a man to write a certificate of divorce and to send her away,” cry the Pharisees. There were provisions in the law allowing for divorce, so thus divorce is allowed, isn’t it? Jesus responds, “Because of the hardness of your heart he wrote you this commandment.” In other words, divorce is never the will of God, but because husbands act like selfish, loveless, uncaring brutes and wives refuse to respect and submit to their husbands, the law allows divorce. Because husbands are cowards who refuse to stand up for their families and wives usurp headship in the home, the law allows divorce. Because husbands and wives refuse to forgive each other as God in Christ Jesus has forgiven them, the law allows divorce. Let’s face it. We’ve made a mess of marriage. We haven’t treasured God’s gift of marriage – either our own marriages or our children’s or our grandchildren’s. We’ve fallen into the world’s way of looking at marriage – like it’s insignificant, simply a piece of paper, or some superficial government classification. We’ve made a mess of marriage and we cannot fix it. We cannot undo what we have done. We need to look to Jesus. Jesus doesn’t look at us and say, “Hey, there’s a husband and wife that have such a great marriage full of sacrificial love – they can be part of my Church.” Jesus does not say, “Hey, there’s a marriage that isn’t messed up, they can join me in the Church.” This is exactly backwards. Jesus cleansed us by the washing of water with the Word – in our Baptism! Baptism is a cleansing that purifies and washes (1 Cor. 6:11). He washed us, the Church, to be His bride. We cannot cleanse ourselves, but He cleanses us. Jesus cleanses the Church. He cleanses men from their failures as husbands and fathers. He cleanses women from their failures as wives and mothers. In His Church, Jesus cleanses those who have dishonoured marriage and lived outside of His blessing. He cleanses those who have dishonoured their bodies outside of His design. He cleanses the Church from our failure to act like His bride. That’s the promise of being part of the Church of Christ, of being the bride of Christ. Jesus gives forgiveness to His bride. Unlike a human marriage where both husband and wife bring something into the relationship, our relationship with Jesus is rather one-sided. We bring nothing in except our sin, but out of His great love for us He continually forgives our sin. He prepares us for the great wedding feast that has no end by washing away all of our sins. He covers us in our wedding garment that covers all of our sin. Jesus paid the penalty for the sins of His bride by giving His life for her on the cross, and He is preparing a wedding banquet to celebrate with us for eternity. Scripture uses marriage to point to Christ and the Church. We can readily understand the faithfulness that is expected of husband to wife and of wife to husband in marriage. This helps us to understand the enormity of Jesus’ forgiveness to us for our faithlessness towards Him. Even though we have sinned against Him, He does not divorce us. Despite our faithlessness, He remains faithful, for He cannot deny Himself (2 Tim. 2:13). Despite the sins we have committed during the week, Jesus calls us to receive Absolution from Him through the mouth of the pastor. Despite the sins we have committed during the week, Jesus gives us His body and blood to forgive our sins and strengthen our faith. Husbands, wives, fathers, mothers, children, widows, widowers, grandparents, godparents, divorcees, adulterers – this communion rail is where forgiveness is given to you. The bridegroom of the Church, Jesus your Saviour, here gives Himself to you. It’s rather one-sided. You bring you sins, and Jesus takes them from you, giving you forgiveness of sins, life, and salvation. Because wherever there is forgiveness of sins, there is also life and salvation. Amen.